Al-Qaeda (Arabic: القاعدة‎, Translation: the base) is an international Jihadist terrorist organization founded in the late 1980s to fight the Red Army of the Soviet Union in Afghanistan, during the 1980–89 Soviet Invasion of Afghanistan. According to the 9/11 Commission Report, Osama bin Bin Ladin and his comrades had their own sources of support and training, and they received little or no assistance from the United States, which only provided funding to indigenous Afghan mujaheddin, which al-Qaeda was not. It was led by Osama Bin Laden until he was killed by Navy SEALs and CIA operatives on May 2, 2011. It is predominantly composed of fanatical Sunni Muslims. Ayman al-Zawahiri, former leader of the Egyptian terrorist group called the Islamic Brotherhood, now leads Al Qaeda since Bin Laden's death. Zawahiri has increasingly become the spokesperson for the terrorist network. By 2018, Al Qaeda remained a major global terror threat. Al Qaeda is responsible for the September 11, 2001 attacks on the World Trade Center and Pentagon killing 3000 Americans, the bombings of American embassies in Kenya and Tanzania in 1998, the October 2000 bombing of the USS Cole, and numerous other deaths and attacks. The group's wing in Iraq, many of which came from Libya, were responsible for insurgent attacks and bombings. The 9/11 Commission Report cites Bin laden meeting with Iraqi intelligence officials in Khartoum as early as 1995. Bin Laden declined reported Iraqi offers of a safe haven, instead settling in Afghanistan. Friendly contacts between Iraqis and Bin Laden continued, though there is no evidence of an operational relationship between the two sides. "However difficult the fight in Iraq has become, we must win it," Mr. Bush said in discussing the 2007 Iraqi troop surge during a commencement speech at the U.S. Coast Guard Academy in New London, Conn. "Al Qaeda is public enemy No. 1 for Iraq's young democracy. Al Qaeda is public enemy No. 1 for America as well." Some liberals seem to have a problem calling this group what it is, a radical Islamic terrorist organization, and prefer to use the more politically correct terms: militant organization and its members rebels. A March 7, 2007, article entitled, "The Redirection" described a recent shift in the George W. Bush administration's Iraq policy, the goal of which Hersh said was to "contain" Iran. Hersh asserted that "a by-product of these activities has been the bolstering of Sunni extremist groups that espouse a militant vision of Islam and are hostile to America and sympathetic to Al Qaeda." 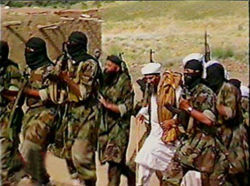 By late 2009 analysts were reporting a decline in the strength and appeal of Al Qaeda. Its leadership was forced to retreat to remote mountain villages in Pakistan, and many leaders had been killed by missiles and manhunts. Its tactics of killing innocent civilians were said to have lost favor with the Muslim population in some countries. During the Bush/Cheney years of 2002 and 2009 the notion that suicide bombings are "often or sometimes justified" plunged across the Islamic world. Its terrorists launched 10 major attacks worldwide in 2004 but only three by 2008. "Al Qaeda is in the process of imploding," concluded professor Audrey Kurth Cronin of the National War College in Washington. In September 2009 American-led forces killed the leader of the Somali organization "Al Shabab," which is allied with Al Qaeda; the police in Indonesia killed the most wanted terrorist in Southeast Asia. It has become much harder for terrorists to move agents, money and supplies. Sen. Richard Blumenthal, Abdelhakim Belhadj, Sen. John McCain, and Sen. Lindsey Graham. Belhadj, a veteran jihadi, was kidnapped by the CIA in 2004 and "rendered" to Libya where he spent 7 years in prison being "rehabilitated." He was released in March 2010 to reactivate the Libyan Islamic Fighting Group, of which Ansar al Shariah was part. In August 2011 he was appointed commander of the Tripoli Military Council by the TNC, and in 2015 head of the Mujahideen Shura Council in Derna. "the financing, planning, facilitating, preparing or perpetrating of acts or activities by, in conjunction with, under the name of, on behalf or in support of," "supplying, selling or transferring arms and related materiel to" or "otherwise supporting acts or activities of" Al-Qaida [...], Usama bin Laden and the Taliban." In 2002 an arrest warrant was issued for Belhadj by the Libyan authorities after Gaddafi's reconciliation with Western powers and three assassination attempt's on Gaddafi's life by the LIFG. The arrest warrant alleged that Belhadj had developed "close relationships" with al-Qaeda leaders, and specifically Taliban chief Mullah Omar, and to have run and financed training camps for Arab mujahideen fighters. After the US invasion of Afghanistan in late 2001, Belhadj fled and was arrested in Malaysia in 2004 where he was rendered by the CIA to Libya. on Friday March 8, 2011, President Obama told reporters he would appoint an official to maintain contact with the "Libyan opposition." The number two official at the U.S. Embassy in Tripoli, Christopher Stevens was tasked with helping to coordinate assistance to the "rebels," whose top military commander, Abdelhakim Belhadj, was the leader of the Al Qaeda affiliate, the Libyan Islamic Fighting Group (LIFG). Hillary Clinton attended a meeting in Paris with Stevens and representatives of the "Libyan opposition," as did U.S. Ambassador Gene Cretz, who has also had contacts with the "opposition." Clinton discussed what she persuaded the Obama administration to do to help the jihadis, and that they would do more than just provide humanitarian aid. Wall Street Journal reported on April 2, 2011 about Americans' training terrorists in the port city of Derna; when the Americans left to concentrate on the Syrian operation, terrorists beheaded people in front of small children as part of their training. The Libyan Islamic Fighting Group (LIFG) is centered in and around Derna and Benghazi. The Sinjar documents captured during the Iraq insurgency revealed 20% of all Iraq insurgents came from Derna, Sirte, and Misurata, 82% of which volunteered for suicide attacks. In 2015 twenty-one Christians in Derna were beheaded enmasse. On February 22, 2012, in a show of bipartisanship, Senators Richard Blumenthal, John McCain, and Lindsey Graham visited Libya and meet with Abdulhakim Belhadj, who was put in charge of training jihadis in Eastern Libya (principally Derna and Benghazi) by the Obama administration for the second leg of Operation Zero Footprint in Syria. On October 5, 2014, the Shura Council of Shabab al-Islam Derna, Libya declared itself part of the Islamic State. In February 2015 the ISIS jihadis beheaded 21 Christians and distributed an uncut video of the gruesome event to world. On March 2, 2015 Katherine Herrige of FOX News reported that Obama administration senior intelligence officials told her Abdelhakim Belhadj is firmly aligned with ISIS and supports the Islamic State training camps in eastern Libya. "Critics say Libya's new position as a safe haven for ISIS reflects one of the most significant policy failures of the so-called Arab Spring." Herridge added that counter-terrorism sources have confirmed that the new support base for ISIS in eastern Libya is now providing "tangible assistance" in the form of training camps around the city of Derna, in addition to a growing number of Libyan fighters joining the terror group in Syria and Iraq. For a more detailed treatment, see Al-Qaeda in the Maghreb. The Benghazi rebellion started as a series of protests in eastern Libya on February 16, 2011. Ansar al-Shariah, an offshoot of Al-Qaida in the Maghreb (AQIM), vowed to overthrow secular strongman Muammar Gaddafi and establish Sharia. Abdel-Hakim al-Hasidi of the U.S. organized Libyan Fighting Group said jihadists who killed American troops in Iraq were now serving on the front lines in Libya. NATO's Supreme Allied Commander James Stavridis told the Senate Foreign Relations Committee days before President Obama publicly admitted he ordered intervention that U.S. intelligence knew al Qaeda and Hezbollah elements were among the Libyan insurgents. By October 2011, Libyan rebel fighting groups with support from NATO, overtook the capital of Tripoli and toppled the government. Ghaddafi was captured and brutally and sadistically murdered. The jihadis were immediately recognized by the U.S. and the U.N. as the legitimate government. Mustafa Abdul-Jalil, chairman of the National Transitional Council, announced that Sharia will be the source for all legislation in Libya and that all laws conflicting with Sharia are null and void. Abdel Rahim al-Kib, the country's interim prime minister, echoed Jalil's words a couple of days later. Around the same time these statements were made an Al Qaeda flag was flown above the Benghazi courthouse, and reports were surfacing that the Libyan jihadis imposed Sharia law in some parts of the country even earlier. U.S. intelligence says as many as 20,000 advanced Russian surface-to-air missiles were missing. Some of those missiles reached the hands of Hamas in the Gaza Strip. Obama crowing just days after the murder of Americans, "The future must not belong to those who slander the prophet of Islam." With several U.S.embassies besieged on the anniversary of the September 11 attacks, White House Press Secretary Jay Carney declared authorities had no reason to believe the attack on the sovereign territory of the United States consulate in Benghazi less than two months before the 2012 Presidential election, resulting in the deaths of several Americans, was a terrorist attack. Two weeks to the day after the attack which killed four Americans including an Ambassador and left many with puzzling and unanswered questions, President Obama declared victory from the speakers platform at the United Nations using the premise of his strawman talking points, "[T]he future must not belong to those who slander the prophet of Islam." ↑ 9/11 Commission Report, The Foundation of the New Terrorism, pg. 56. ↑ Mora, Edwin (October 6, 2018). Al-Qaeda Remains Top Global Jihadi Threat on 17th Anniversary of Afghan War. Breitbart News. Retrieved October 6, 2018. ↑ Hersh, Seymour M. (March 5, 2007). "Annals of National Security: The Redirection". The New Yorker. http://www.newyorker.com/reporting/2007/03/05/070305fa_fact_hersh. ↑ Vicken Cheterian (May 2012). "Libya’s rebel leader with a past". Le Monde Diplomatique. http://mondediplo.com/2012/05/08libya. ↑ "'We Are Simply Muslim': Libyan Rebel Chief Denies Al-Qaeda Ties", 4 September 2011. ↑ "From Holy warrior to hero of a revolution: Abdelhakim Belhadj". ↑ Burr, J. Millard (2014-10-13). "Libya – Ali al-Salabi and the Re-Emerging Muslim Brotherhood." American Center for Democracy. ↑ "Profile: Libyan rebel commander Abdel Hakim Belhaj", 5 September 2011. ↑ Ian Cobain. "Special report: Rendition ordeal that raises new questions about secret trials", 8 April 2012. ↑ US Names Chris Stevens Liaison to Libyan Opposition, ABC News Radio﻿, March 14, 2011. ↑ The Sinjar Documents are a collection of al Qaeda computer data captured by Americans in 2007 in a predawn raid near Sinjar, Iraq, six miles from the Syrian border. ↑ Libyan rebel commander admits his fighters have al-Qaeda links. ↑ Libyan, Once a Detainee, Is Now a U.S. Ally of Sorts. ↑ How Obama turned on a dime toward war. ↑ Interview with Jon Stewart of the Daily Show. ↑ Clinton says militants used weapons from Libya in Algeria attack, Reuters, Jan 23, 2013. Top Ranking CIA Operatives Admit Al Qaeda Is a Complete Fabrication. Difference Between Taliban and Al Qaeda. Are Theological Tensions Distancing Taliban From Al-Qaeda? This page was last modified on 15 April 2019, at 00:06. This page has been accessed 51,330 times.